Inspire hours of imaginative and adventurous play with this Zootles giant wall decal. 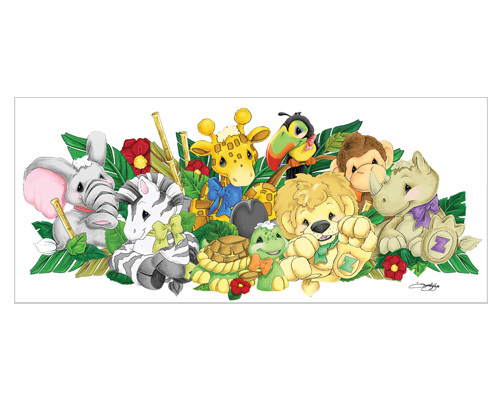 Your child will love the whimsical atmosphere created by these cute and colorful characters (lion, zebra, toucan, elephant, giraffe, turtle, monkey, and rhino), and you will love how easy it is to tranform a room in minutes with this repositionable Zootles peel and stick mini mural. Our Zootles peel and stick giant wall decals (also known as peel and stick murals) are repositionable, removable, re-usable, and washable... the perfect combination for decorating kids' bedrooms or playrooms. This Zootles repositionable giant wall decals mural set offers decorating ease with no damage or residue to the surface.